SsangYong, the South Korean car manufacturer, has unveiled the Actyon Sports at the Geneva Auto Show 2012. 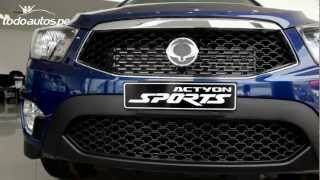 The SsangYong Actyon Sports is a production ready pick-up truck, which reflects the growing demand from drivers with an interest in outdoor activities and extreme sports. The new Actyon Sports reflects the growing demand from drivers with an interest in outdoor activities and extreme sports. With a fresh interior and exterior design, and equipped with its new e-XDi diesel engine, Actyon Sports has been reborn with better fuel efficiency, a more powerful performance and convenience features to meet the needs of a wide variety of customers. 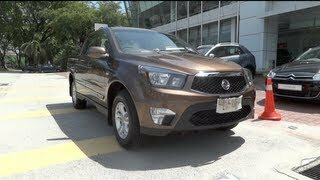 SsangYong Motor Company will officially launch the new Actyon Sports production ready pick-up at this year’s Geneva Motor Show. The new Actyon Sports reflects the growing demand from drivers with an interest in outdoor activities and extreme sports. With a fresh interior and exterior design, and equipped with its new e-XDi diesel engine, Actyon Sports has been reborn with better fuel efficiency, a more powerful performance and convenience features to meet the needs of a wide variety of customers. Designed to be the perfect vehicle for everything from weekend leisure activities to city commuter driving, the car’s sharp, contemporary design and spacious cabin reflects the unique strength and dynamics of SsangYong Motor. After two years development and an investment of over 60million Euros, the new Actyon Sports is a third generation model, inheriting the brand values of the first generation Musso Sports and second generation Actyon Sports. Delivering the perfect blend of performance and economy, Actyon Sports is powered by the latest e-XDi active diesel engine. Peak torque is delivered from only 1,500rpm, providing optimum performance on all roads and terrains including slopes, steep curves and rough surfaces. As a result, even though the car retains its frame chassis construction, fuel economy of 7.4 L/100km represents a 7.5 per cent improvement in fuel efficiency compared to the previous model. With more frugal economy also comes increased performance. The e-XDi active engine provides maximum power of 155ps and peak torque of 360Nm, which is a 16 per cent improvement over its predecessor. Maximum torque is consistent between 1,500rpm and 2,800rpm, providing ample performance in what is typically the most commonly used part of the rev range. 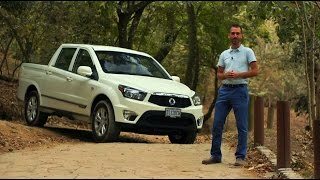 Ample low end torque of 190Nm allows the Actyon Sports to tackle tough off-road terrain and maintain SsangYong’s legendary reputation for off-road capability. The new car has been styled to reflect SsangYong’s modern and efficient engineering. From the front, it is dynamic yet sophisticated, complemented by a mesh radiator grille and trapezoidal bumper, and stylish black headlight bezels provide a luxurious touch. In profile, the sharp belt line runs to the rear bumper emphasising the sleek, sporty appearance, and from the rear the wide glass area not only gives excellent rearward visibility but also complements the transparent rear lamps, providing the car’s signature look. 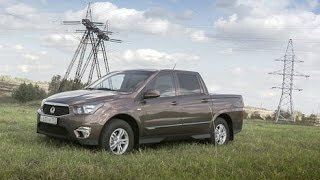 As with every SsangYong, practicality is at the core of the new pick-up’s appeal. A large, flat rear deck provides a 2.04m2 load area, accessed via a tailgate which takes only half the effort to open (11kgf) compared to that of its predecessor (21kgf). Inside the cabin there’s a smart and sophisticated environment, created by using black and metallic finishes along with an LED illuminated instrument cluster. Quality leather can be specified to trim the comfortable seats, while passengers in the rear can recline their seats by up to 29 degrees. Safety is maximised with the Actyon Sports’ super strong tri-structure frame. Manufactured using SsangYong’s cutting edge frame technology, this strength will help protect occupants in the event of a collision. Furthermore, accident avoidance is also enhanced by ESP and the option of an advanced 4WD system to provide the ultimate road grip. 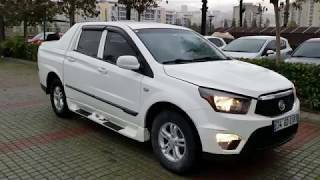 Actyon Sports will be known as Korando Sports in certain markets including Korea, the United Kingdom, Turkey and Algeria. UK specification and launch date still to be confirmed.